Clubhouse opens at 7:00am. First tee time is 8:00am, depending on season - please call ahead. Oak Hollow Golf Course is located adjacent to Oak Hollow Lake. This challenging, scenic layout will test all your golfing skills. We hope that its beauty and superb conditions will make your experience a memorable one. For a list of our programs click here, or visit the Oak Hollow Golf Course online resource. Please call Oak Hollow Golf Course for more information. Card entitles the bearer to a $5 discount off of each 18 hole round of golf with cart, played now throughout 2019. Good seven days a week, and applies to Seniors and Ladies' Day rates as well. Cards are good through December 31, 2019 but are non-transferable. Buy yours today and save all year long! actual days may vary slightly, please inquire at the pro shop or call ahead. Rate includes green and cart fees and a $3 voucher for the grillroom. From its opening in 1972, this course is fortunate to have many of the unique characteristics of a Pete Dye design including railroad ties, pot bunkers, several peninsula greens and even an island tee. However our small, undulating greens serve as our most recognizable DyeDSC trademark. For more information or to schedule a tee time, visit the Oak Hollow online resource. 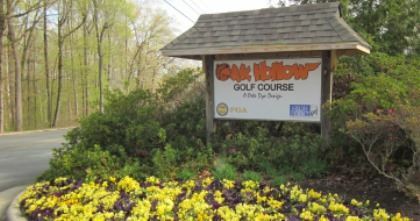 The Oak Hollow Golf Course has several highlights on its fantastic course. For a list of these highlights, please see our Hole Highlights page. Oak Hollow Grillroom offers daily lunch specials (PDF) on weekdays. You can even call ahead for takeout orders. Grillroom hours are 7:00am-5:00pm daily.